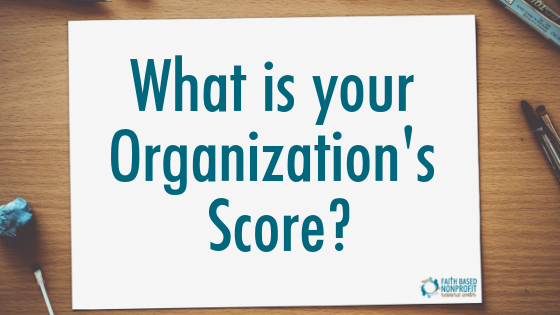 What is your Organization’s Score? How does your organization really function? We often will look at how our programs and services are functioning (and if we don’t, our funders will), but I mean really digging deep, looking at functioning at every angle. An organizational assessment can help you learn about your organization for once you know the strengths and challenges of your organization, you are able to make changes to help it to grow and thrive. You might ask, what is an organizational assessment? Well, I am so glad you asked. An organizational assessment is a paper or electronic document where key individuals affiliated with the organization respond to question about the organization’s functioning in different areas. Nonprofit Best Practices indicate that organizations can benefit from an organizational assessment about once every other year. Ideally, nonprofits will want to have a sampling of key staff and key volunteers complete the assessment; and to ensure staff are comfortable responding as honestly as possible, all responses should be confidential. If an organization has just a few staff, then the entire staff should be invited to complete the assessment. Otherwise, a balance of direct service providers and well as key management staff should participate. In addition, the entire board of directors should provide their perspective by completing the assessment. Once the assessment has been completed, the real work begins. An objective individual should compile the data provided in the assessments to give a picture of where the organization is at the present moment. It is important to remember that the assessment is simply a reflection of the organization at a specific point in time. After the data has been complied, members of the leadership team and the board of directors will need to prioritize an action plan to move the organization forward. For most organizations, it is extremely helpful to have an outside consultant/mentor work with the organization to develop an action plan and make changes. This individual can work with the organization by providing an outside perspective without passing judgment or placing blame on any individual about the current situation. For an organizational assessment to be effective, key organizational staff (CEO) and board members must commit to accepting the findings of the assessment and then working to make changes to make the organization stronger and more effective. The results of the assessment can over whelming; but, they do not have to be. Instead, of looking at all the work ahead, it is better to prioritize the work to be done. Set small goals-focus on just a few areas where improvements are needed. Then, when those areas are “better,” move onto other areas. When the entire organization makes a commitment to being the best it can be, and when everyone works together to get there, organizational change can happen through simple steps. BUT, a commitment to excellence must be made. Could your organization benefit from an organizational assessment? Contact us today to discuss your needs with us. Previous: Previous post: Should We Be Using Best Practices?